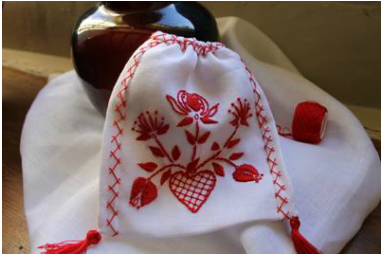 Make and embroider this little bag, using various raised stitches and knots typical of this striking monochromatic work. This style of embroidery originates from the ancient city of Guimaraes in Portugal, where traditionally, the bags were worked by the women of the area to hold their lunches when they went to the fields to work. A sandwich bag! The bag measures 17cm x 15cm. Will be run again on demand. Please contact us to register your interest. One 6" embroidery hoop, preferably one where you have two hands free. like a seat frame, if you have one. The bag is worked on pure white linen using red cotton perle thread. As well as traditional stitches like french & bullion knots, you will learn stitches and techniques such as raised fishbone, padded satin stitch and Portuguese knotted stem.